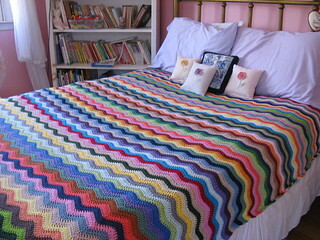 This is the Neat Ripple Pattern from Lucy at Attic 24. I'm not using nearly as many colors - I only have 5, and I'm doing 6 rows of each color. I have only completed one section of each color, and I just started the second section of the first color. In case you haven't noticed, I'm working on blogging every other day. It seems like a lot, but I thought I would see if more frequent updates would help readership. I'm also trying to update my project page in Ravelry more, to see if that helps. We'll see how it works. Please leave a comment to let me know you're reading! Now that things have slowed down a little with the children (hubby is still on the mend - he went to urgent care and got medication yesterday), I hope to make really good progress. I'm keeping busy, even if it's not in crafty ways. How's your new year progressing so far?